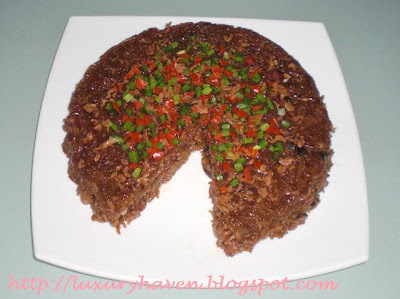 Make Your Own Delicious Glutinous Rice With Sea Salt! You are here:Home » Recipes » Make Your Own Delicious Glutinous Rice With Sea Salt! Love eating that Glutinous Rice from your neighbourhood stall? Why not try making your very own with all your favourite ingredients & what’s more? Discover the negative impact of using salt vs sea salt. A growing number of people are getting more health-conscious & many are turning to sea salt in their cooking for better quality & taste. Why use a fake chemically-produced salt substitute when you can use a natural environmentally-produced less sodium sea salt? Sea salt blood pressure - It’s commonly known that eating too much salt can cause high blood pressure. The regular table salt that people use in their cooking does not dissolve in the body & over time, begins to block arteries etc, causing serious harm to our bodies. The sea salt will flow through your body & do more good than harm. So try to use sea salt for all your food preparation to enrich the flavour of your food while adding vital nutrients to your diet. The other key ingredient here is Chinese Dried Shrimps. I love the unique fragrant flavour, which is very different from fresh shrimps & I like using them in my dishes. The shrimp need to be reconstituted in warm water before being used. In turn, this water is sometimes added to the dish for flavour. 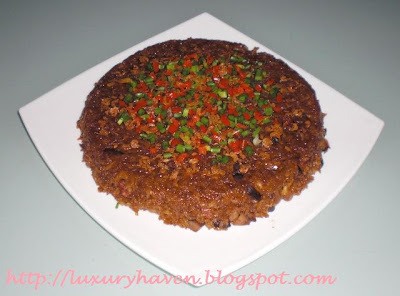 For this home-made Glutinous Rice, I’ve used 2 different types of dried shrimps. Unfortunately, I don’t have the names for the classes of shrimps. The slightly bigger ones in the picture are for mixing into the rice & the tiny, weenie ones for topping, replacing the usual shallots. Soak rice in water for an hour. Soak Hebe & mushroom in warm water till soft. Remove stalk from mushroom & dice into cubes. Peel off outer layer & dice sausage (optional). Most people skip this step but I don’t like the taste & texture of it, so I’d always take it off. Heat wok & fry mushroom, sausage, peanuts & hebe till fragrant. Drain rice & add to mixture. Fry for about 2mins. Add seasonings & stir well. Transfer into steaming bowl/mould & add water. Stir lightly & steam for about 20mins. Meanwhile, chop up spring onions & chilli & set aside. shrimps. Remove & leave to cool. When rice is ready, transfer to serving plate. Leave to cool. Sprinkle spring onion, chilli & top with crispy shrimps. Remember, for a healthy choice in your daily meal, choose the all-natural sea salt! Sea salt obtained from solar evaporation of sea water is entirely different from modern refined salt & it contains a variety of minerals that play a role in keeping the body's electrolytes in a healthy balance. This looks healthy, unique and tasty! Hi Thanks for recipe. This is one of my son's favorite dish. I am going to try out later when I got home. And, most importantly, HAPPY BIRTHDAY! Miranda, pls try it if you haven't. It tastes great! Agapejen, it's my hubby's fave too. Thks for your well wishes! Mary Moh, we've another sea salt fan here :) Thks for visiting! Penny aka jeroxie, it's economical & tasty. Thks for comments! This looks great! I do always use sea salt, it's the best! This looks really good. I haven't eaten this in a long time. This is one of my comfort foods. 5 Star Foodie, great to meet another sea salt fan! My Little Space, perhaps you'll like to substitute the soya sauce with more salt instead? Cheers! Simply Life, it's good & cheap too! Divina Pe, I cook this often as those selling outside have very little ingredients.